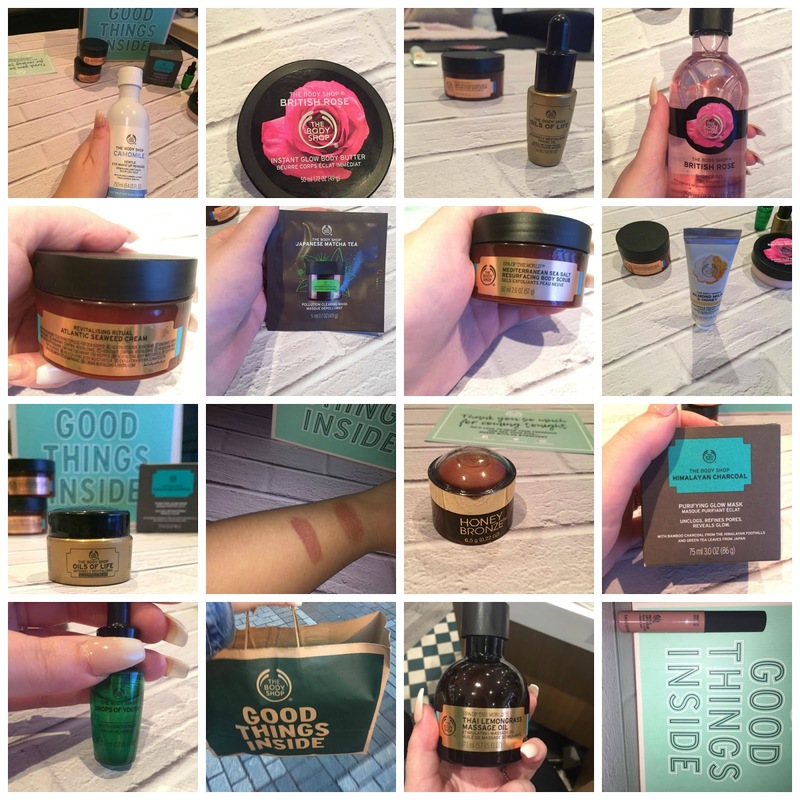 On Wednesday last week I attended my first ever blogger event at the Body Shop in Leeds! I've been blogging since 2014 and have never been to one, can you believe it?! I think it's a combination between the fact that they were either held on a weeknight when I worked away from the city or I was simply too nervous to go but this time I dragged my friend along and off we trotted on a Wednesday evening after work. Anyway so on Wednesday we finished work and headed off to Trinity Kitchen to grab a light bite at Pho whilst we chatted about what to expect. We were both so excited beforehand because we were anticipating what the new range would be like and how the evening would pan out. I was particularly excited to see Em Sheldon in the flesh. She's such an inspiration and really down to earth, I'm obsessed with her blog! 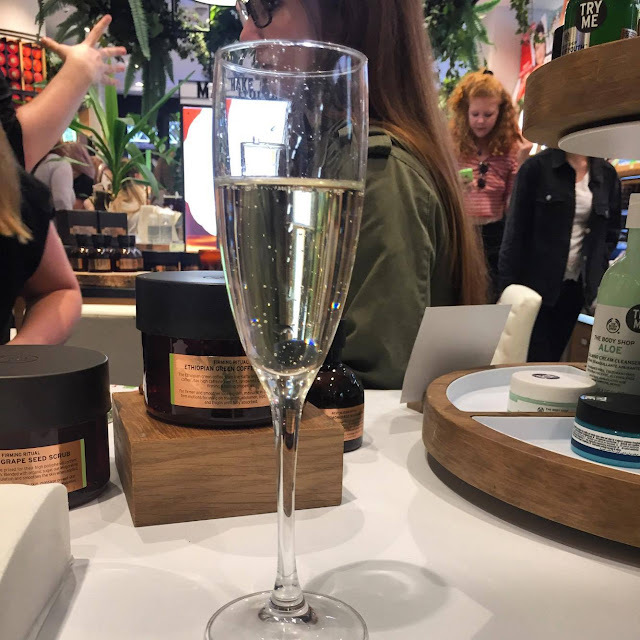 When we arrived on Briggate at the Body Shop store we were greeted by a big crowd of girls (and boyfriends in tow) waiting for the store to open. At roughly around 6.45 we all entered the store, grabbed a glass of prosecco and grabbed a seat. During the evening we learnt all about the Spa of the World range and heard all about Em's tips on how she keeps relaxed and looks after herself. We had a demonstration on how to ease tension in your neck and shoulders by giving each other massages and enjoyed delicious nibbles in between. Once the talks were over we had the chance to wonder around the shop and trial and test the products from the range. We were also treated to a 30% discount throughout the store and received an amazing goody bag too worth £30. The Spa of the World collection is designed with pampering in mind and it's all about creating ways to relax and unwind in the comfort of your own home. The thing that I love most about it is that the ingredients from all the products comes from different countries around the globe and is sustainably sourced to the highest quality. The creams and oils smell incredible and are SO soft. I honestly felt like my skin was smooth for days after, they're just fab. There are three ranges; The Revitalising, Relaxing and Blissful. The products in the revitalising range are marked with a blue tab and are designed to give you a lift if you're feeling run down, tired or stressed. I think I've got to say this is definitely my absolute favourite and it smells incredible! There are 5 products in the Revitalising range including the Mediterranean Sea Salt Scrub, Atlantic Seaweed Cream, Mediterranean Sea Salt Candle, Moroccan Rhassoul Body Clay and the Thai Lemongrass Massage Oil. The Mediterranean Sea Salt Scrub is full of coarse crystals that help make the perfect texture for a body scrub. 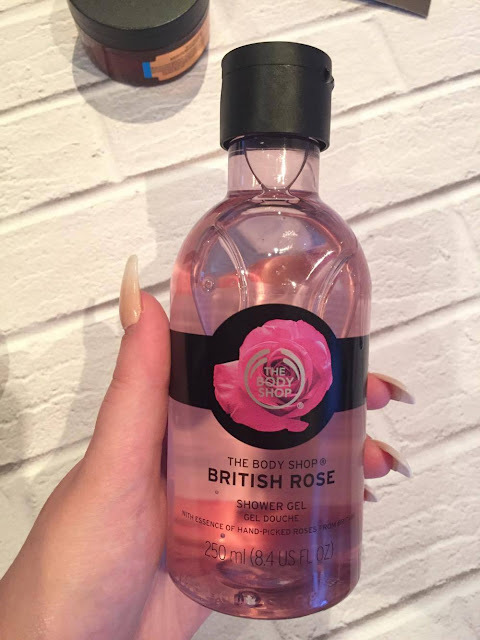 I used this to exfoliate my body prior to fake tanning and it got rid of all the dead skin and removed all my excess tan, I was pleasantly surprised. 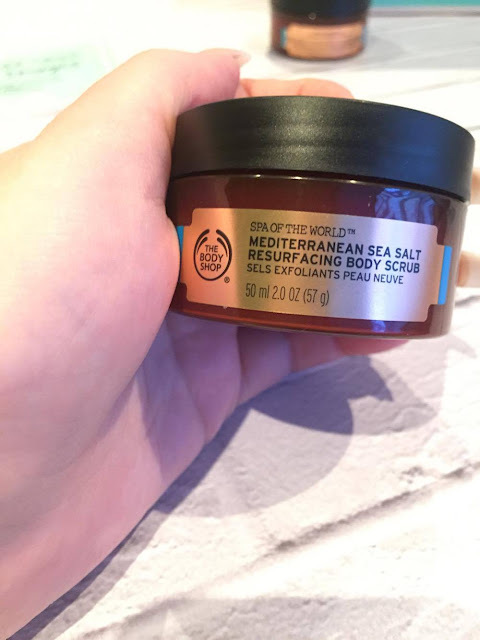 The scrub is infused with sea salt from the Mediterranean and when massaged into the body it not only exfoliates but leaves the skin feeling so moisturised too. It's hard to explain but you need to try it. 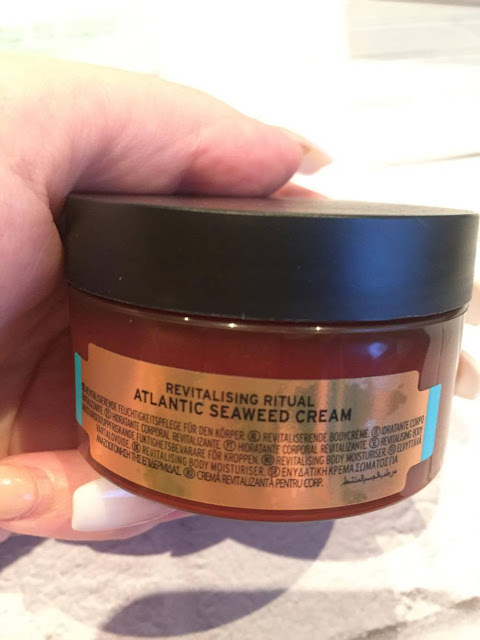 The Atlantic Seaweed Cream is an amazing body cream that helps refresh the skin and give it back the much needed hydration. I suffer from dry skin so this product is perfect for me. I even picked a tub because it was so good. 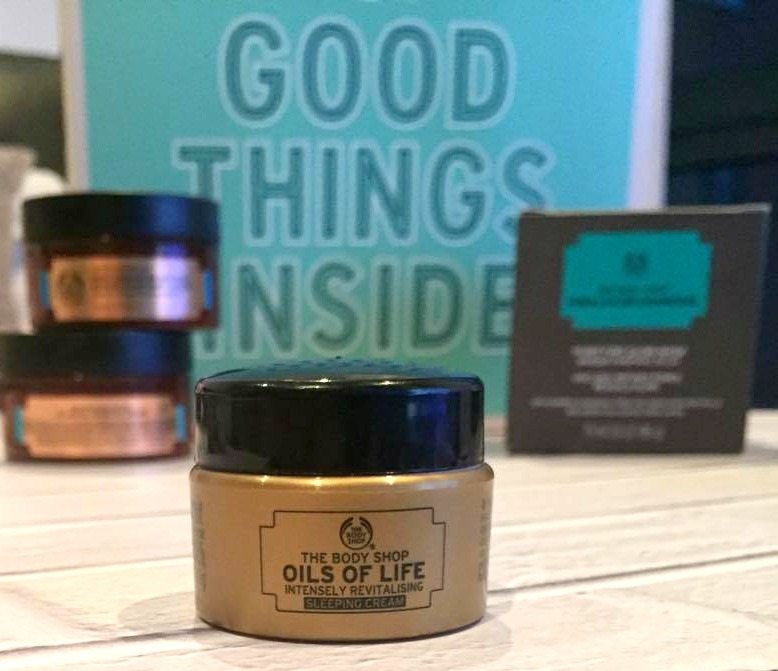 The cream has seaweed extracts from the Atlantic and is full of oceanic minerals. Did you know Body Shop do candles?! GAME CHANGER. I legit want my bathroom to smell like the spa when I'm having my pamper evenings. The Mediterranean Sea Salt Candle has a really fresh scent and makes you feel awake and alive. The Moroccan Body Clay is used for firming the body and is great for helping with cellulite and stretch marks. It comes from the Atlas Mountains in Morocco and leaves the skin looking more toned and contoured. It's obviously not a miracle worker but as Em said, it's a great one for using post gym as it helps keep everything feeling tight. This body oil smells divine; legit it smells like a spa. I could not stop smelling my arm when the lovely lady gave me a hand massage and used the product. It was honestly so nice. The oil is great for using as a massage oil and revitalises both your body and mind. 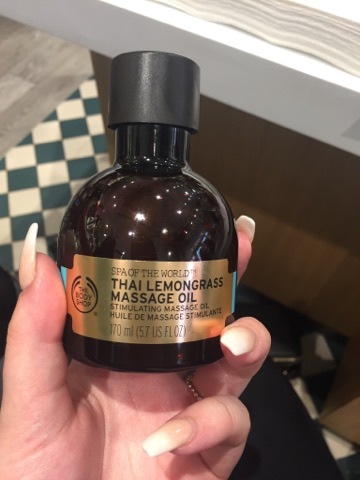 It's made with lemongrass from Thailand and it an oil that leaves your skin feeling so healthy and nourished. The products in the relaxing range are marked with a purple tab and are designed to give relieve stress and tension in the body by providing a calming and relaxing atmosphere. There are 6 products in the Himalayan Charcoal Body Clay, African Ximenia Scrub, Egyptian Milk & Honey Bath, Japanese Camellia Cream, French Lavender Massage Oil and the Japanese Camellia Candle . The Himalayan Charcoal Body Clay helps to draw out all your impurities and clear up the skin. 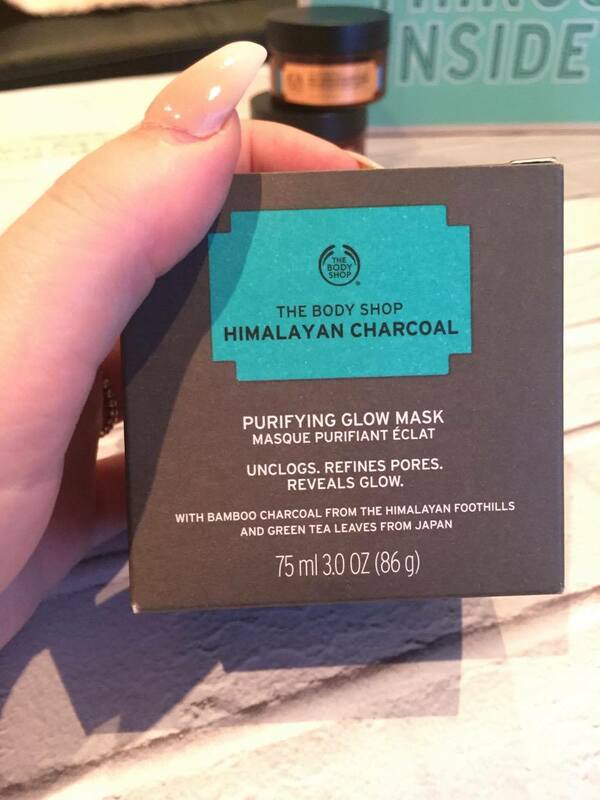 The mask is enriched with bamboo charcoal from the Himalayas in India and once rinsed off the skin it leaves your body feeling as smooth as a baby's bum. I didn't think I'd like this as much as I have dry skin and charcoal isn't the best for that as it can dry you out but as long as it's used once a week rather than three or four times then that's ok. I love this. The African Ximenia Scrub is made with oil that is handpicked in Namibia in Africa from the Tree of Life. The scrub is great for exfoliating before tanning and leaves the skin feeling super soft and smooth. The Egyptian Milk & Honey Bath milk is a powder to milk consistency and comes from Egypt. It is designed to make your bath water soft and keeps the skin feeling smooth. It's fab for a pamper evening. 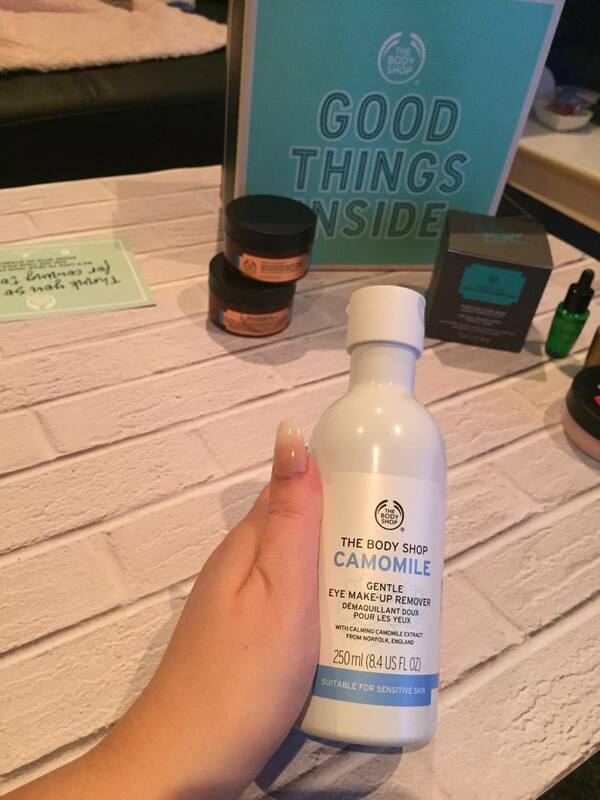 The Camellia Cream makes skin feel smooth and hydrated and helps relax the body. The oil hails from Japan and has been used by Japanese women since the 8th century to help them soften and moisturise their skin. The French Lavender Massage Oil is a relaxing oil that makes you feel like you've wandered into the spa. The lavender comes from the South of France and is one of those scents that sends me to sleep - perfect for a pre bedtime pamper. This oil isn't my favourite because I have lavender in my underwear draw so it reminds me of that but it does smell lovely nonetheless. The Candle has a delicate floral scent and puts you straight into a relaxed mood. It's definitely a nice candle to light in the evening time when you're painting your nails, reading a book or writing blog posts. The products in the firming range are marked with a green tab and are designed to firm your skin. There are 3 products in the range including the Ethiopian Green Coffee Cream, French Grape Seed Scrub and the Thai Makrut Lime Firming Oil. The Ethiopian Green Coffee Cream is a firming body cream and is enriched with Ethiopian green coffee and Community Trade olive oil from Italy. It is 100% vegan and is designed to help your skin feel firmer and smoother. The French Grape Seed Scrub is infused with grape seed powder that hails from France and community trade organic sugar from Paraguay. The scrub is another one of my favourites because I fake tan a lot so need to constantly scrub the old tan off. This exfoliating scrub aims to refine your skin but also has a fresh scent that keeps you feeling awake. It is also 100% vegan too. The Thai Makrut Lime Firming Oil helps keep your skin feeling nourished and the scent helps to re-awaken the senses. Again this product in the firming range is 100% vegan. The products in the Blissful Ritual Range are all labelled with a yellow tab. This range is all about nourishing and nurturing the skin and has 2 products in the range; The Brazilian Cupuacu Scrub-in-oil and the Polynesian Monoi Radiance Oil. This oil contains tiare flowers from French Polynesia and helps to achieve glowing skin and hair. The Monoi is an amazing blend of coconut oil and fragrant tiare flowers and the oil makes for a great multi use product. The products in the Nurishing Ritual Range are all labelled with a orange tab. This range has 3 products in the range; Tahitian Orchid Massage Oil, Hawaiin Kukui Candle and Hawaiin Kukui Cream. The massage oil is infused with vanilla orchid from Tahiti and blended with ylang ylang and patchouli. It is used when the body is in need of luxury and a good pamper. This candle reminds me of summer evenings and pure relaxation. This is a great one to burn during the light evenings after a pamper. The Kukui nut absorbs the radiance of the sun's rays and takes you to a place of escapism and happiness. The Hawaiian Kukui Cream is made with the same Kukui nut and helps to keep the skin feeling nurtured and glowing. The cream is rich and luxurious and helps you to feel relaxed and pampered. Honestly, the range is absolutely amazing and smells sooo good. I wish you could smell the products, if you have a Body Shop near you then definitely go and check it out. If you're in Leeds, I definitely recommend going to see the store, the staff are lovely. My friend and I honestly had such a fab time at the event and we are so thankful for our products in the goody bag. I look forward to hopefully going back for another event soon in the future. Have you tried any of the Spa of the World Range before? 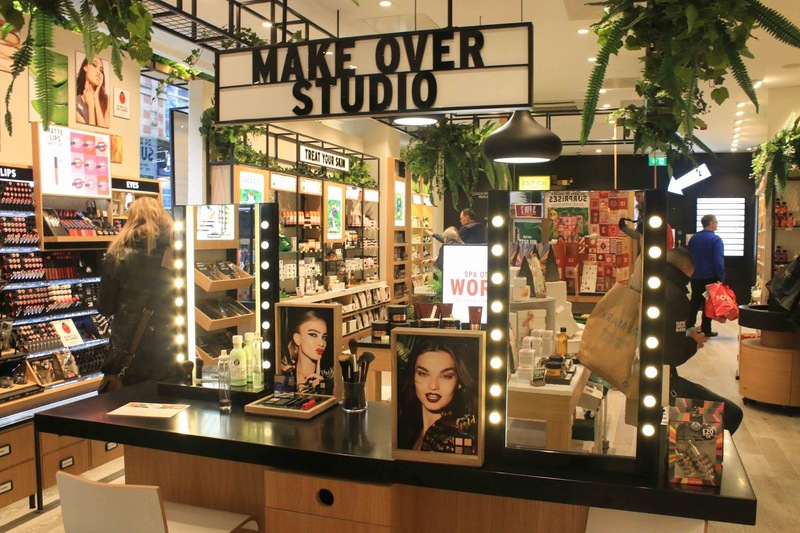 Do you often shop at the Body Shop? Let me know your product recommendations below.